Trial Balloon - "Fool One Another"
Trial Balloon is a Dayton, Ohio-based band whose music is a mixture of blues, dreamy Pink Floyd acoustic tunes, and Hendrix influenced acid rock. The core of the band is Alex Sator who plays guitar and wrote all the songs, and Layne Loxley on drums, keyboards, and vocals, with guests on vocals and bass. So I've pointed out a bit of a mixture, but after several listens I've determined that coherence reigns and stylistically the songs do flow quite well. For example, the disc opens with "Party Killer", an acidic Middle Eastern guitar instrumental with a driving percussion beat. This leads into "Change Happening", an acoustic vocal number that sounds like it would be very much at home on "The Wall". The next track is "Asymmetrical" which is a short bluesy guitar bit that leads into "Fool One Another", a bluesy track that really stuck in my head. It's one of those simple tunes that just stays with you. I liked the combination of bluesy licks and acoustic rhythm guitar. These first several tracks run a gamut that gives a good feel for Trial Balloon's stylistic interests. Though the band doesn't in most cases sound like Pink Floyd, that band is a good comparison because they also often moved through acoustic tracks, blues, and aggressive psych from one track to the next. Among the other highlight tracks is "At The Bazaar" which is similar to "Party Killer", but the atmosphere is more laid back. The acoustic guitar/percussion combo reminded me a bit like something from Steve Tibbetts first couple albums. "Danger" is a 60's pop-psych number á la Syd-era Pink Floyd complete with cool backward loops and freaky guitar. Building on the psych freakout mode is "Troubled Individual", an instrumental track that I would have liked to hear the band develop a bit more. Barely two minutes, it ends a bit abruptly and just feels like it would have liked to keep going a bit. "Fool Another One" is something of a "Fool One Another" reprise, but the blues guitar here has taken a tab, tie-dyed itself, and gone into Hendrix mode. This mode climaxes on "Down The Drain" in which Sator brings the disc to its finale on a harsh, gorgeously acidic note. In summary, Trial Balloon will appeal to fans of older Pink Floyd and anyone into blues-based psychedelia. The CD is only 36 minutes long, and at 4:11 "Party Killer" is the longest track. 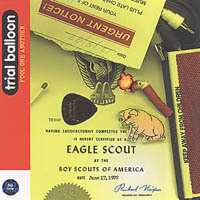 But the 14 songs work well as a collection that represents the varied sides of Trial Balloon. Available through the CDBaby web site.